John Deere 15W-40 Plus 50's unique additive package offers lower wear and superior protection against high-temperature thickening for better engine protection. This oil provides maximum reliability and performance and is preferred in all John Deere diesel engines. 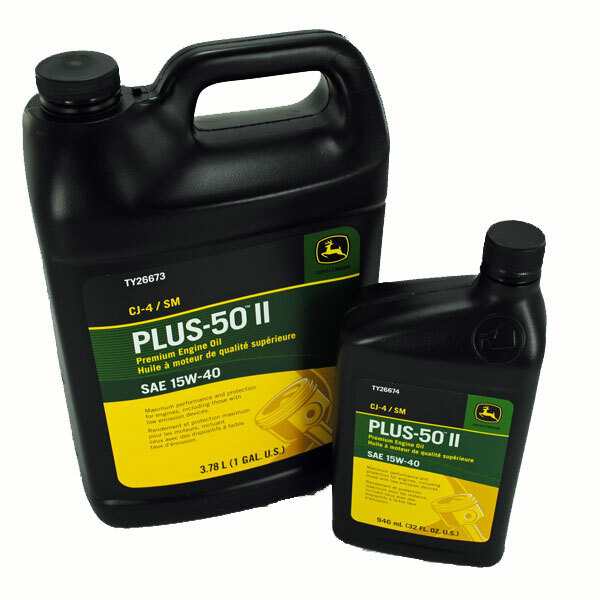 Plus-50 Engine Oil has been developed to meet the exact needs of John Deere engines. It is an exclusive John Deere formula that also meets or exceeds the current industry requirements and can be highly recommended for use in all engines requiring oil with API service classifications of CI-4 PLUS, CI-4, CH-4, CG-4, CF-4, CE, CD, as well as SL and SJ. Exclusive unique additives formulated to exceed the needs of heavy-duty off-road equipment. A balanced additive system that controls oxidation and corrosion, and results in lower deposits. Exclusive additive package lowers engine wear and provides superior protection against hightemperature thickening as compared to competitive oils. Meets John Deere JDQ78X high-temperature engine test standards. Formulated specifically to reduce wear, oxidation, and deposits; and provide corrosion protection with superior soot control. Approved Mack EO-N Premium Plus 03.